As you can tell from my banner, my daffodils are in bloom. So welcome spring with this bunny from Durene Jones FB page. You can find the chart by going here. It’s from March 2016 posting and it captures the essence of spring. Here is another cute Easter bunny to put together. The idea comes from Art & Ricamo and she points to Sylvia’s for the pattern. Here the pattern is set for all one color, but you can see it’s easy to mix it up. She also specifically has a PDF to download that says Easter. Just scroll down to the end of the post and click on the link that reads, “PDF Download Easter / Easter / Paques”. From there, she gives you a choice. It would make a cute ornament for an Easter Egg Tree. This Dutch site called Nenne Design has some great free charts including this Happy Easter one. From the home page, look for FreeBees on the upper bar. Enjoy looking around but if this is the one you want it’s called FreeBee Happy Easter. I love this idea of making beautiful permanent Easter Eggs from cross stitch. This I found on a web site from Germany that I’d never been to before and she offers the patterns right on the same page. Her bunny one is too adorable to pass up too. In addition she gives detailed instructions on how she did the eggs here. Check it out. Wonderful! 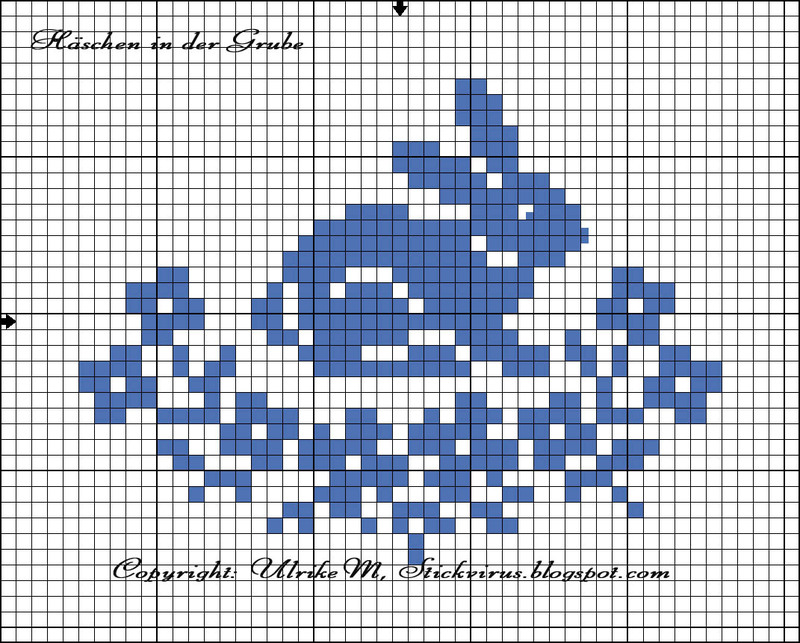 If you are in need of a little bunny to stitch up quickly here is a wonderful example on The Wandering Bunny using a free pattern offered by Windy Willows. Have fun, and thanks for stopping by. Last week I gave you this link. I thought it was a neat design so I stitched it up. It goes together quickly so you might want to consider doing for yourself. It was a great weekend with granddaughter but I had very little time for stitching. Have a great day, and thanks for stopping by.